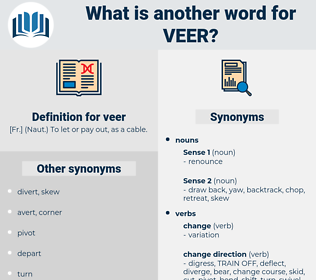 What is another word for veer? [ Fr.] ( Naut.) To let or pay out, as a cable. straighten, go direct, stay, keep to. continue, remain, keep, hold, endure, bide, retain, persist, abide. Thus, Holland consisted of two members, or branches - the nobles and the six chief cities; Flanders of four branches - the cities, namely, of Ghent, Bruges, Ypres, and the " freedom of Bruges;" Brabant of Louvain, Brussels, Bois le Due, and Antwerp, four great cities, without representation of nobility or clergy; Zeland, of one clerical person, the abbot of Middelburg, one noble, the Marquis of Veer and Vliessingen, and six chief cities; Utrecht, of three branches - the nobility, the clergy, and five cities. 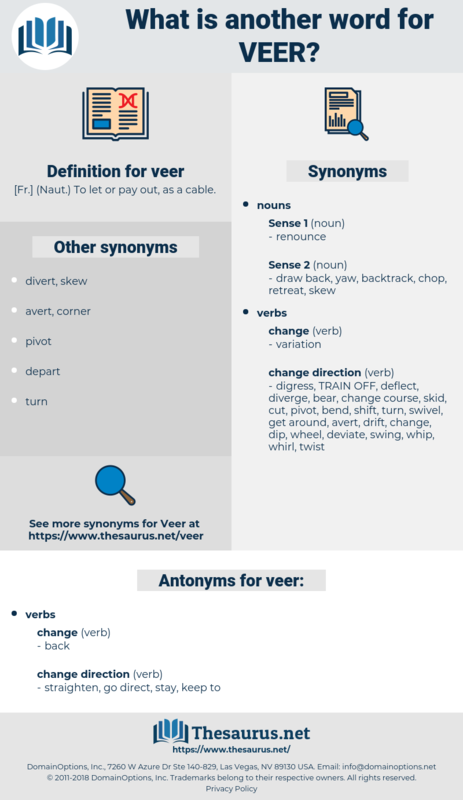 Should they veer round or steer ahead?